The Rainbow Solidarity Network made a statement about the ban on the 4th Izmir Pride March. The network announced that the march is cancelled and condemned the Izmir Governorate. The network will hold a press conference on 6 June. The Rainbow Solidarity Network organizing Izmir Pride March made a press statement regarding the ban on the march by the Governorate. The Network condemned the Governorate’s homophobic, biphobic, and transphobic attitude. It announced that the march was cancelled. Izmir Pride March, which was planned to take place on 4 June at 19:00 for the fourth time, was banned by the Izmir Governorate. Previously, the Ankara Governorate had banned the 17 May International Day Against Homophobia and Transphobia march in Ankara organized by Kaos GL. We find these kinds of bans on LGBTIs’ freedom of expression to be unacceptable and condemn the Izmir Governorate’s homophobic, biphobic, and transphobic attitude. Our application for the march was submitted on 23 May and approved by the Governorate and the Police Headquarters. However, the fact that the march was cancelled on the last day, towards the end of working hours and at a time when we wouldn’t have the chance to object, makes this ban illegal. Furthermore, the fact that the ban used expressions such as “propaganda for terrorist organization” and “a march that looks innocent but can cause indignation” when the march has taken place in peace for years is proof that LGBTIs are not seen as equal citizens. The suspicion of terror is the most important repressive argument by oppressive regimes to suppress society. The decision states that the intelligence of “chanting slogans praising illegal terror organizations” was “partially” confirmed. Such a vague, baseless, and frivolous statement preventing our democratic right to demonstrate is unacceptable. We announce to all who stand against homophobia, biphobia, and transphobia that this year the march cannot take place under these circumstances. We will hold a press conference about the Izmir Governorate’s discriminatory attitude that targets LGBTIs on 6 June at 11:00 at the Konak City Council and share details about the process with the public. Despite all the bans and the neglect, the rainbow’s struggle for equality and freedom will continue! The Rainbow Solidarity Network: 9 September University Equal Lane Community, Ege University LeGeBİT Community, LGBTI Commission of Eğitim-Sen Izmir Branch 2, HDK Izmir LGBTI Commission, Izmir LGBTI Initiative, Izmir LGBTI High School Initiative, Black Pink Triangle Izmir Association. 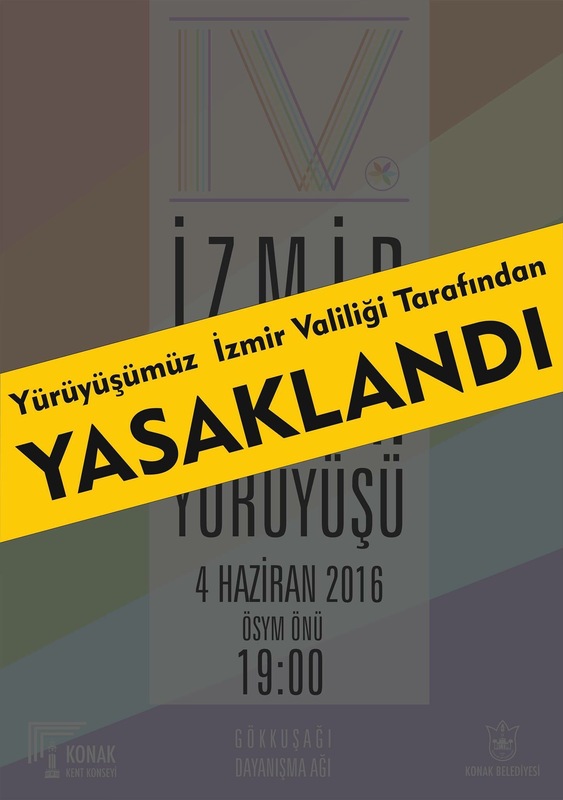 After the ban on the Ankara March against Homophobia and Transphobia, the Izmir Governorate has banned Izmir Pride. The reasoning for the ban includes the statement “propaganda for terrorist organization”. The Rainbow Solidarity Network organizing the march will make a statement. “There have been certain tips that some persons or groups working for terror organizations will infiltrate the crowd during the demonstration; will conduct provocative acts to disturb the peace and quiet of society by provoking the crowd; will chant slogans praising illegal terror organizations during the demonstration; will open pieces of cloth that are the so-called flags of illegal organizations; these persons or groups infiltrating the crowd will attack security forces stationed there as well as public institutions, public and private vehicles with rocks, bats, Molotof cocktails, and improvised explosive devices; and will commit terror crimes. These intelligence tips have been partially confirmed”. The Ankara Governorate banned Kaos GL’s March Against Homophobia and Transphobia scheduled for 22 May to celebrate IDAHOT. The Governorate put forth “certain social sensitivities” as the grounds for not finding the march “suitable” and refused to ensure the security of the march. It also lifted the decision of stay of execution by objecting to the Regional Administrative Court.